Violet Hull, age 100, formerly of Magnetic Springs, died Thursday afternoon, February 10, 2011 at the Riverside Methodist Hospital at its In Patient Hospice. 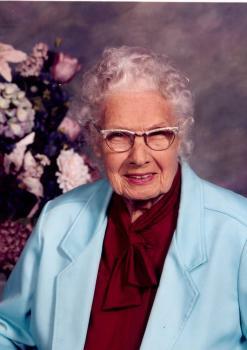 She was born May 3, 1910 in Marion to the late James and Eva Chloe (Bellis) George. She was also preceded in death by her husband, Otis Hull on January 3, 1994, whom she married on December 12, 1933 in Covington, KY, a granddaughter, Barbara and a brother, Alex. She was a 1928 graduate of the Magnetic Springs High School and worked for over 40 years in the hotels at Magnetic Springs as a waitress and a maid, and for over 20 years at the Conrad Hotel as a Bath Attendant. She was a member of the Magnetic Springs U.M. Church, was a Sunday school treasurer for over 30 years and taught Sunday school for a number of years. She is survived by a son, James (Judy) Gibson, Bellevue, Nebraska; five grandchildren, Paula, Robert, and Thomas of Florida and Jennifer (Joel) Daggett of Omaha, Nebraska and Ronald (Angie) Gibson of Council Bluffs, Iowa and numerous great-grandchildren and great great grandchildren. Graveside services will be held Tuesday, February 15, 2011 at 11:00 am in the Claibourne Cemetery with Pastor Linda Chamberlain-Jones officiating. The Stofcheck-Ballinger Funeral Home, Richwood is in charge of arrangements. Memorial gifts may be made to Magnetic Springs United Methodist Church at 113 Olive St. Magnetic Springs, Ohio 43036. Condolences and remembrances may be expressed at www.stofcheck-ballinger.com. Though it had been years...I still loved her dearly. Violet was my grandmother and I will miss her dearly. She will live forever in my heart. She has finally gone to Oties side where she has wanted to be for years now. My she rest in peace. Amen. My deepest sympathies for the family and friends of Violet, especially James(Bob), whom I know held her in a very special place in his heart. I know she rests in the arms of our loving Saviour forever. I grew up next door (Magnetic Springs) as a child with the Hulls. I remember sitting on the porch with them during the summer nights listening to the Reds play on the radio. Wonderful people who helped shape my childhood. God bless them both. Violet was my Great-Grandmother. I only got to visit her a few short times, but I will chersh those memories forever. You just can't get any sweeter that Violet. She loved her family with all she had and we will forever love her back. I loved this lady from the bottom of my heart and I will miss my Grandma so very very much. I have many fond memories, like going to the bath house with her, the many wonderful birthday cakes she made me, chocolate cake with her famous caramel icing, and who could forget her melt in your mouth butterscotch pies!!! Picnics in the side yard and homemade ice cream. You may be gone from this earth Grandma, but you will never ever be gone from our hearts. Rest in peace, as I am sure you are with your "Otie" and even little Penny too. My sympathy to the family. I thought Violet was a very good lady. My parents did too. She was an asset to the Magnetic Springs Methodist Church. I find it difficult to express in words the connection I enjoyed with our Grandma. Violet was the one person who held an otherwise shattered family together. Through separations of siblings, cousins, parents, Violet remained in loving touch with all. Altho the list of people I have known and loved my entire life has grown shorter, I am more than thankful my Grandma topped that list for my 56yrs. You will always be in my heart of hearts. Give Grandad a hug for me. now you;re forever an "Angel'! Not many people in the world get to know or remember their Great Grandmother and I am truly blessed to have had my time with mine. She never missed a Birthday or Christmas card. I will forever remember the beautiful stationary of her letters and the kind and encouraging words they contained. It boggles the mind how many traits I inherited from her and I am proud of them all. May she find peace and happiness in the Hereafter with Otis and the friends and family that have passed before her. I will love her deeply and always, May just won't be the same without a trip to OH10 to see her.